Without water, none of us would be here. Scientists are now closer to knowing exactly why that is. A study recently published in Proceedings of the National Academy of Sciences provided strong evidence as to how and why water is essential to life. It shows that proteins cannot fold themselves into a particular shape to enable biological reactions. It is, in fact, the water molecules that do the job. According to Dongping Zhong, lead researcher of the group from Ohio State University, scientists have long been trying to figure out how water interacts with protein. This answers many questions about protein structure, stability, function and dynamics. Zhong and his team used ultrafast (picoseconds or 1/1 trillion of a second) laser pulses to capture an image of water molecules moving around DNA polymerase, an enzyme essential for replication. 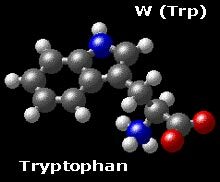 They inserted molecules of tryptophan, the amino acid erroneously blamed for making people drowsy on Thanksgiving, into the protein as a probe and measured how water molecules move around it. Proteins usually fold a thousand times slower than the speed of water molecules flowing around each other. In an earlier study, the team was able to show that water molecules slow down when they encounter a protein but are still moving a hundred times faster upon connection. In this new study, the scientists figured out water molecules directly touch the “side chains” of the protein, or “the part that bind and unbind with each other to enable folding and function.” The team also took note of the timing of movement in the molecules. Simulations at the Ohio Supercomputer Center (OSC) also helped them visualize the molecular processes. In other words, water cannot manipulate protein any which way. The manipulation of how it folds depends on the amino acids of which it is composed.